A very beautiful end of summer here in the Northeast, but a little too quiet – I haven’t heard from many of you. Let’s continue the dialog we had at Reunion, and, for those of you who couldn’t make it, let us know what you did this summer. Write me! 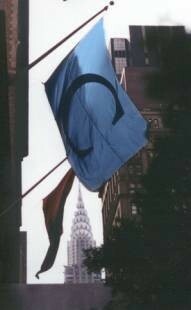 I have the sad duty to inform you that Thomas W. Twele died on March 20, 2008. He was a physician in Anniston, Alabama. If you have memories of Tom, I hope you will send them to me so that I can share them here and in Columbia College Today. Steve Clineburg is the first to respond to my plea for more photos from our 45th Reunion. I have posted them here (click this link to see them), and will gladly post more if you send them to me. By the time you read this, we will be about to start the fifth year of our Second Thursday Class of ’63 lunches at the Columbia Club in NYC. So far, over 40 of your classmates have attended, and some of the regulars have been to over 30 of them. So plan on visiting NY and join us. The next gatherings are on September 11 and October 16 (note: the date has been re-scheduled a week later because of Yom Kippur). In the meantime, let us know what you are up to, how you’re doing, and what’s next. Please join your classmates for an informal lunch at the Columbia Club every second Thursday of the month. It is our hope that these gatherings will renew old friendships and foster improved relationship with our class and the College. I hope you can all join us at the next lunches on Thursday, September 11 and October 16. Let me know if you will attend so that we can reserve a big enough table; RSVP to Paul Neshamkin (pauln@helpauthors.com). We had a great turnout for our July 10th lunch with eight classmates attended on a beautiful warm, summer day. Among the regulars pictured below were Jerry Dwyer, Doron Gopstein, Bob Heller, Bruce Kaplan, Paul Neshamkin, Larry Neuman, Tom OConnor, and Barry Reiss. 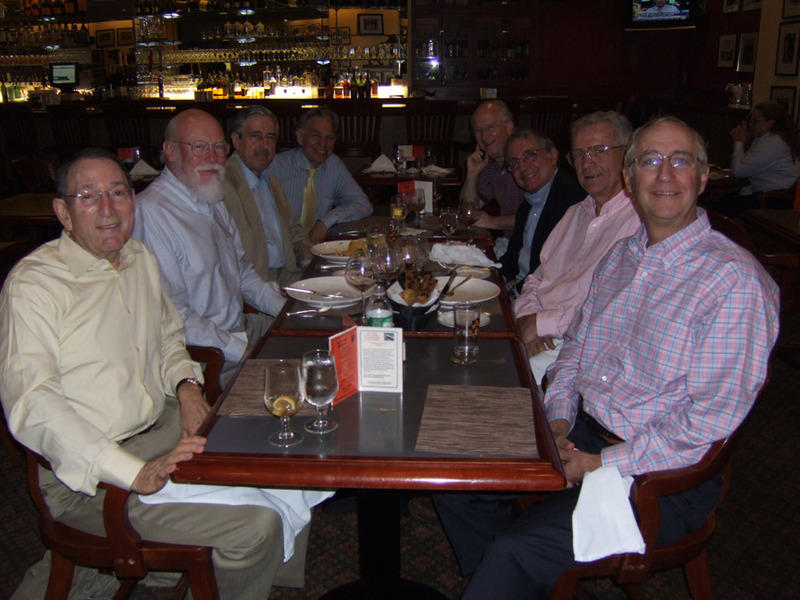 (Seated from left to right) Bob Heller, Paul Neshamkin, Doron Gopstein, Larry Neuman, Jerry Dwyer, Barry Reiss, Tom O'Connor, and Bruce Kaplan. Sid Kadish writes, “After many years of receiving brochures from the Columbia Alumni Association advertising cruises in the Mediterranean, one finally arrived this spring that really grabbed me. It read ‘Journey of Odysseus: Retracing the Odyssey through the Ancient Mediterranean.’ I caved when the cover of the brochure showed a detail from a Greek vase depicting a Siren playing a two horned flute before a frustrated Odysseus strapped to his mast. The trip turned out to be terrific. We had four professors including Richard Sacks, a Columbia classicist, and three others: an archeologist, an art historian and a humanist from the U of Chicago who discussed the tension between Plato and Homer. We were back in college, but we had wonderful field trips in Turkey (Troy), some Greek islands, Malta, Sicily, and even Naples/Pompeii, land of the Cyclops. There were no papers and no exams. I received a press release from Steve Barcan’s law firm, Wilentz, Goldman & Spitzer, that he has been selected to appear by Chambers and Partners USA in its register of America's Leading Lawyers for Business. Steve is his firm's administrative shareholder and past chair of its Land Use and Environmental Team. He is also the past chair of the Land Use Section of the New Jersey State Bar Association. Patrick Cary-Barnard has posted some videos on You Tube about his efforts in Montreal to fight artificial turf. He writes, “There is actually a family of four of these "Westmount Park Videos" up on YouTube right now, all accessible at the user name Pimento3. I am also producing a film called “Fennario's War," featuring a reading by Canadian playwright, David Fennario, of a play for a single actor about World War I.” I don’t know how many of you have been experimenting with posting videos (or photos) on the Internet, but if you have anything posted you like me to link to from www.cc63ers.com, please let me know. Classmates-Gone-Green Department: Barry Reiss, in addition to installing solar panels to generate his home's electrical needs, has owned a Zap Zebra (www.zapworld.com) for over a year. This three-wheel electric car, which seats four, can cruise along at 40 mph, and, according to Barry, is the perfect car to drive to the station or do local shopping. No pollution, no cost for gas, just charge it up every night. Let's hear what you're doing to end dependence on fossil fuels. I hope you'll try to make one of our Second Thursday Class lunches. The next gatherings are on September 11 and October 16 (note: the date has been re-scheduled a week later because of Yom Kippur).